These mushrooms are slow-cooked in wine and butter for 9 hours. My family couldn’t quit talking about how divinely scrumptious they were. I’m just afraid I will be asked to make them at every gathering. Of course, they go perfect with beef. They could possibly be a meal in itself, served with a baked potato and salad. Thoroughly wash mushrooms and put into a large stockpot. Add all the remaining ingredients and stir to combine. Bring to boil over medium-high heat. Reduce heat to low and simmer, covered, for 6 hours. Remove the lid, then continue cooking, uncovered, for 3 hours. 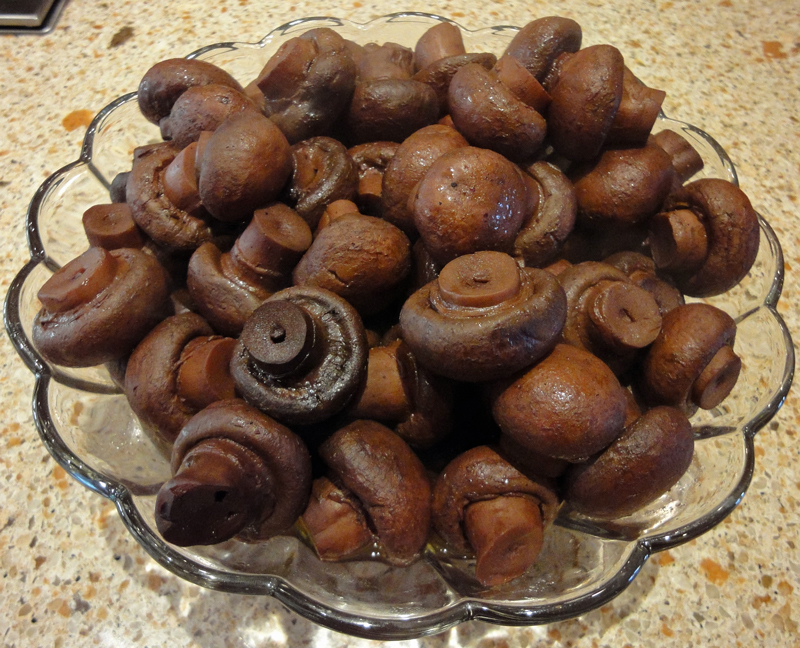 Serve mushrooms with liquid in bowl. Any remaining liquid, put in a small pitcher and serve over your beef or use bread to soak up the liquid. I know that 9 hours seems like a ridiculous amount of time for a dish but these are ‘out of this world’ delicious.